I am making my first game in ShiVa which uses a terrain without any textures. When I turn on the "receive dynamic lighting" and set an appropriate color settings for the ambient and diffuse light, the seams that are farther from the camera start to be disconcertingly visible. The interesting part of this issue is that the color of the seams obviously depends on the diffuse color of the terrain. The seams are always significantly brighter than the diffuse color. I tried a bunch of different settings when creating the new terrain but the result is always pretty the same. If you are willing to help me to get rid of those unwanted artifacts - look at the attached picture. It clearly depicts this issue. Thanks to all who is willing to help me. Thanks to the creators of ShiVa. It's a great tool. indeed looks weird, but hasn't been reported yet, so chances are there's something weird going on and not a systemic problem. Are you planning on using no texture at all in the final product as well, or will you use a texture in the end? In any case, i'd suggest you make a single material layer, call it "base" or something like that, and make a render pass over all terrain chunks (low quality and low res to save time). Let me know if the problem is still there. 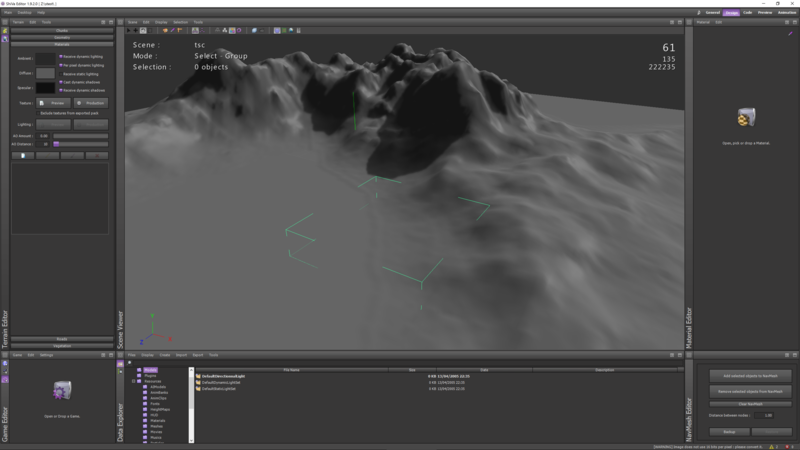 If you are willing to share the heightmap, I could have a go at generating the terrain on my machine and check what's going on. Broozar, first thanks for such a quick reply. Yes, I do plan to NOT USE textures at terrains at all. I tried to follow the steps you suggested: create a material layer and render it (I tried all the variants: preview & production, Texture & Lightning) - unfortunately, I see no difference after that but I am not sure if I got your ideas well. What do you exactly mean by the low res and low quality settings for the rendering? Could you direct me. Sorry for my ignorance. I would really appreciate your opinion about the cause of this problem. - there's a "soft borders" slider in there, does it change your visuals if you set it to 0 or 1? [EDIT] PS: can't reproduce so far. the issue seems to be resolved. I simply unchecked the checkbox "Force per vertex computations" in the Light attributes and the artifacts are gone now. You did help me a lot even though your contribution might not be obvious at first sight . Thanks a lot.